This year was a big one for traffic changes in the capital. The Luas Cross City is now up and running through the heart of the city. IT’S FAIR TO say that Dublin commuters and people living in the city have had a pretty disruptive year on the traffic front, or a disruptive few years really. While diversions, closures and road works seemingly a constant occurrence it was trying at times. But with the bedding-in of traffic flow changes along the quays and the much-anticipated completion of the Luas Cross City, it feels as is if things have turned a corner in the latter part of this year. In the huge nine story office block that is home to Dublin City Council at Wood Quay, those whose job is to keep the traffic flowing feel a difficult year has ultimately been a successful one. What they point out is that Dublin is a growing city and one which is getting busier with the economic upturn in the past few years. A city which has over 200,000 people coming into the centre every morning, many via different methods than in previous years. Brendan O’Brien, head of technical services in DCC’s traffic department, says the city’s traffic flows must also change to keep up with current demand and future trends. “You’ve only a finite amount of space in the city, and what we’re talking about is really the optimum use of space,” O’Brien says. It’s not about trying to discourage people from using cars, it’s not even about doing whatever. It’s about saying look, by removing 2,000 vehicles from turning right off Bachelor’s Walk into quite a crowded area we can make that work better and speed it up. The changes O’Brien is referring to are along the North Quays where traffic was reduced to one lane for cars and where the right turn onto O’Connell bridge was banned for private vehicles. The changes were introduced in August and the National Transport Authority has since said travel times for buses along the quays have been reduced by 45%. Some business groups were opposed to the changes, as were those in the car parking industry, but O’Brien says prioritising buses makes the most sense because that mode of transport holds the most people. “There was one lane of traffic taken out and replaced by a bus lane, but also it meant that buses were able to overtake other buses that were stopped at bus lanes So as well as segregating out traffic from that lane, it also gave the buses a bypass. The right turn change was to keep the area around O’Connell Bridge, D’Olier St, College Green free of cars as much as possible, that was also quite successfully implemented and there’s been pretty good compliance with it. Even aside from issues of environmental sustainability, the numbers tell their own story about why the push for public transport can’t be let up. Between 6-10 am during the week, about 65,00 people come into the city by private car while 98,000 come via public transport. Others walk, cycle or take a taxi but the main consideration here is that the overall number is expected to increase in the coming years. Last year, the average number of people crossing the two main Dublin canals into the city each day was 202,000. That number is at about the same level as 2007 and is up from a low during the recession of 181,000 in 2010. That we’re now at a number close to the 2006 peak shows that Dublin commuting is about to get even busier than it was during the Celtic Tiger. It is for this reason DCC says it had to ensure that the city was prepared for this expected growth. As O’Brien explains, an extra 40,000 commuters of the next few years simply cannot be catered for by cars. “The only way we can do that is to be prioritising public transport by putting in new forms of public transport and prioritising it and making it easier to walk and cycle,” he says. We’re often portrayed as anti-car, we’re not. We have a limited amount of space that we have to care for. Part of this increased capacity for public transport has of course recently come on stream with the Luas Cross City connecting the red and green routes. The new trams had some teething problems the first weekday running of the service but they seemed to be ironed out pretty quickly. 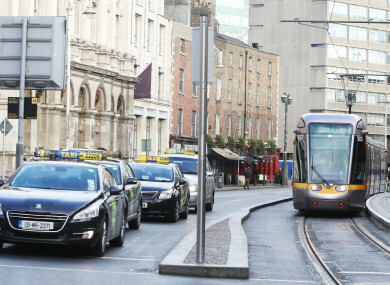 It’s too soon to give any definitive verdict on how the Luas Cross City has affected traffic in the city or how many people are using it, but O’Brien says that “anecdotally we’re hearing that the trams are full”. Next year, plans for traffic changes very much depend on what projects get the go-ahead and whether planning permission is granted for projects that are ready to go. One big change could be at College Green where DCC wants to create a pedestrianised civic plaza. The finished plaza could take 12 months to build but once the plans get approved by An Bord Pleanála the traffic changes will be implemented straight away. It will mean that east-west movement of cars down Dame Street towards College Green will be stopped. At present, the plans are subject to a number of objections from Dublin business groups and hotels. A public hearing on the College Green plan is scheduled for 9 January with the An Bord Pleanála decision expected in April or May. “With everything going to play we hope we’ll be making changes in the summer,” O’Brien says. Email “'We're often portrayed as anti-car, we're not' - Dublin's traffic supremo on keeping the city flowing”. Feedback on “'We're often portrayed as anti-car, we're not' - Dublin's traffic supremo on keeping the city flowing”.